How and why did you become involved with Susan G. Komen VA Blue Ridge? Hilary Thompson was a 2018 BigWig. I noticed the commitment she made to the cause. When she asked me to consider being a BigWig in 2019 I was caught off guard. I thought and prayed about it for a couple weeks and had already made up my mind to participate before going to the informational meeting. I hadn’t let Hilary in on my intentions prior to the meeting. As I’ve shared in my BigWig profile, my mother is a breast cancer survivor. Shortly after learning of my mother’s breast cancer diagnosis in 2010, I learned that my father-in-law had been diagnosed with bladder cancer. He lost his battle with cancer in November 2013. For my wife, Danielle, and me to each have a parent battling cancer was horrifying. Watching Danielle lose her father was gut wrenching. I strongly believe that when someone asks for help, then thats what you do. Hilary and the folks at Susan G. Komen VA Blue Ridge asked me to help, and here I am. Describe an uplifting moment you experienced during your time with Susan G. Komen VA Blue Ridge. Danielle and I have two children, Olivia who is seven and Joseph who is four. I’ve had several uplifting moment with them during the BigWig Campaign; however, two come to mind. One afternoon while driving home with Olivia, she asked me about breast cancer out of the blue. We talked for a few minutes about statistics such. As the conversation was winding down, she said, “Dad, I hope you help find a cure for breast cancer before I’m an adult so I don’t die from it.” Talk about hitting me right in the feels. At that moment, I knew without a shred of doubt why I was doing this. Joseph attends Elizabeth’s Early Learning Center (EELC) in Lynchburg, VA. The folks at EELC, wholeheartedly embraced my BigWig campaign. Joseph was a little unsure of me wearing the wig into preschool with him the first day, but as soon as he saw the other kids’ responses, he was all for it. I’ve worn the wig for every pickup and drop off since February 28th. 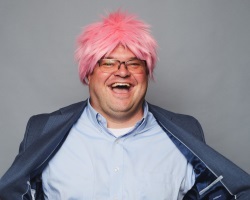 Jane Gerdy, the executive director at EELC, asked me they could be involved, so she and I put together a plan where I would come read to the two oldest classes while sporting my pink wig. I read “The Book with No Pictures” and “I Stink” to both classes and had a grand time. The office staff at EELC put together a pink donation box that stayed at the preschool for a week. Children, and I’m sure a few parents, raided their piggy banks to support my campaign to the tune of $187! Every day during this BigWig Campaign, I’ve been thoroughly humbled by the community of people around me. I could not imagine the outpouring of support and stories that I’d get when this campaign started. What advice would you give to community members about Susan G. Komen? The Susan G. Komen organization is committed to reducing the impact of breast cancer. They’re all in! Everyone I know has been impacted by breast cancer. Take the time and make the effort to learn about the Komen organization and learn how you can help. Say yes when someone asks for your help. What keeps you motivated and committed to Susan G. Komen’s mission? Looking my daughter in the eye and talking to her about breast cancer has been the best motivation I could have. I want to help bring an end to this disease.